We are excited to have the opportunity to co-host a seminar with USMAA Bellingham on Keysi, the fighting method as taught by the founder,Justo Dieguez. This is a rare opportunity to train in one of the only truly innovative martial arts of the last 20 years. Fans of Pananukan, Silat or ‘reality based fighting’ should check out this system. JKD Concepts practitioners should especially see the innovation in the trapping and clinch ranges. 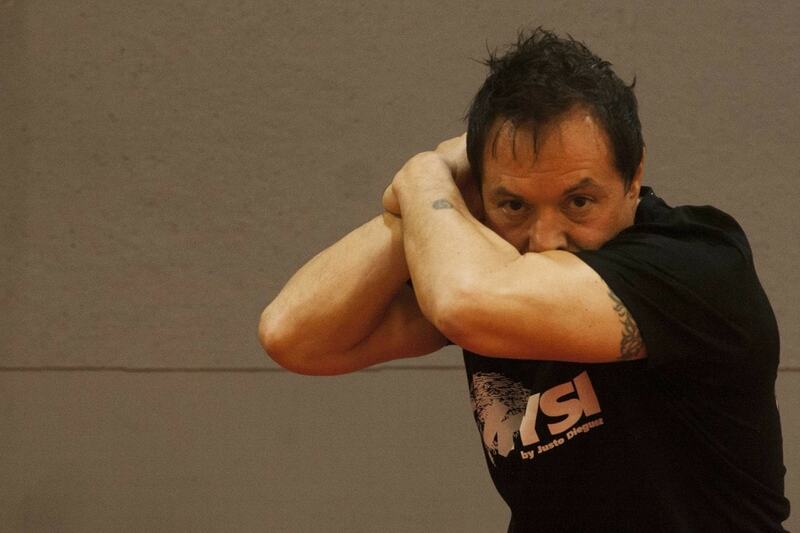 Keysi is a method of self defense that is based on natural fighting instincts, martial arts and street fighting techniques, developed by Justo Dieguez Serrano. Formerly known as KFM or Keysi Fighting Method, it became famous after it was used in the fighting choreography of the movies Batman Begins and its sequel, The Dark Knight. It was also featured in the final scene of Mission Impossible 3 with Tom Cruise. Do not miss this opportunity. This is a trial seminar to see if there is enough interest to bring Keysi by Justo Dieguez to the Pacific Northwest. MKG Students: Financial assistance is available. Don’t let money be the problem. The thinking man or “pensador” is primary in the Keysi method. This defensive shape has the combatant place both hands on his head and he guards his head and face with cyclical movements of the forearms and elbows. The pensador uses a system of “windows” during these rapid and fluid movements to sight the opponent. This system allows the combatant to protect his face and head while maintaining a visual on his opponent. Keysi practices all ranges of attack for combat, but, unlike many traditional martial arts, most fighting takes place in extreme close quarters and uses high, middle, and low lines of attack, working against opponents with or without weapons. From the Pensador defense a variety of counter attacks are launched to vital targets, the biceps, kidneys or solar plexus. Keysi also relies on understanding how people typically move or attack in a fight so that when striking, the opponent’s body is moved to expose more targets. Another aspect is its “360-degree” approach to multi-assailant attacks whether standing, kneeling, sitting or lying down. Part of the Keysi philosophy is the redefining of the terms “predator and prey” as well, where the would-be victim becomes the predator and the would-be attacker his/her prey. Keysi practices all ranges of attack has a Code of Ethics including principals relating to Purpose, Self Respect, Persistence, and Perspective. Purpose is your mission in life. Self Respect is the satisfaction and pride you find in your own achievements and in those you care for, and must be tempered with humility. When purpose is clear and “ego” is under control, the third principle is Patience. It takes patience, effort, and dedication to do a good job, to make an investment which allow goals to be reached and ultimately one’s purpose in life to be achieved. Even though patience is necessary, it will never be enough without persistence. Never give up! Next is Perspective or the ability to understand what is really important and to see clearly in any given situation. Purpose, self respect, patience and persistence are like a wheel whose axle is perspective.